Poker Academy is proud to introduce Poker Academy Prospector, the most in-depth, easy to use poker stats analysis package designed to make you a more profitable player. Poker Academy Prospector comes fully equipped with an abundance of stats, performance reports, hand replayer, advanced stats filtering, multi database storage capacity for all your hands and a clean interface to facilitate your poker analysis. Check out the screenshots and our complete feature list to learn more. Cheaper than a bad play at the table, Poker Academy Prospector will pay for itself in a heartbeat. Get Poker Academy Prospector now for only $59 and let it go to work for you. "It's sobering to see just how much money is lost in certain preventable situations, but it's also exciting to recognize a leak." Poker Academy Prospector provides a graphical representation of your bankroll over all or selected sessions. Your bankroll data is calculated via hands imported from online poker sites or sessions that you manually create, based on casino, home offline or online game results. The graph and data can then be filtered to display very precise data, such as a running bankroll which only takes into account hands in which you were dealt pocket pairs or hands played from the blinds. Easy hand retrieval allows you to pinpoint problem areas or highlight strengths. Selecting any point on the graph allows you to retrieve the particular hand for any data point to analyze. One of the most valuable features in Poker Academy Prospector is the ability to view your performance reports. With just a couple clicks you'll be able to see what part of your game is bringing in the big bucks and which is burning holes in your pockets. Whether you play your suited connectors far too aggressively or your pocket pairs to conservatively we'll help you find the leak. The peformance reports are completely customizable allowing you to get a report on a particular session(s), all sesssions, short handed sessions, sessions in a certain date range, game type etc. If some values are not quite where you want them to be, you are given the option to investigate these hands further and see what you can change in your overall strategy. Detailed player stats allow you to drill down and view your or your opponents' stats in very specific contexts. All stats can be grouped into categories such as results by the number of players in the hand, player's position in the hand, your hand type, your play versus a specific opponent etc. Tired of reading through boring hand history data? While analyzing your play in Prospector, select any hand or session to watch a replay using the Poker Academy table interface. Pause, rewind, fast forward through hands as you watch your hand equity at each action. 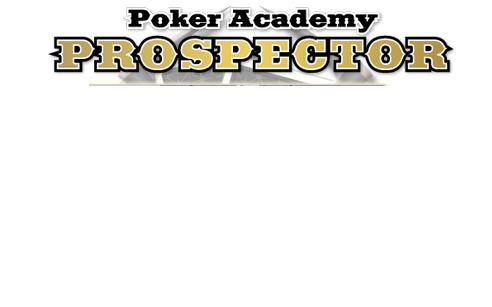 Alternatively Poker Academy Prospector includes multiple hand history viewers. Choose to view the hand in transcript format, or in a customizable graph format. Filter out players who have folded in various positions, view only player's actions who are active at the river etc. Take your game to new heights using some of the most advanced features in poker analysis software. With multiple database capacity import all your poker hands to drill down and find weaknesses that have plagued your game from day one, or that have cropped up recently. Poker Academy Prospector's easy to use interface will have you filtering your stats, and getting you up to speed on the mathematics of poker in no time. Dont risk getting left behind. Having the best poker stats analysis tool on the market in your corner will pay for itself in no time.